The Florida manatee is the largest of all the world’s manatees. In fact, the most gigantic can weigh more than 3,500 pounds! Measuring up to 12 feet from snout to tail, most adult manatees tip the scales at more than 1,200 pounds. That’s four times the weight of the black bear, Florida’s next-largest mammal. 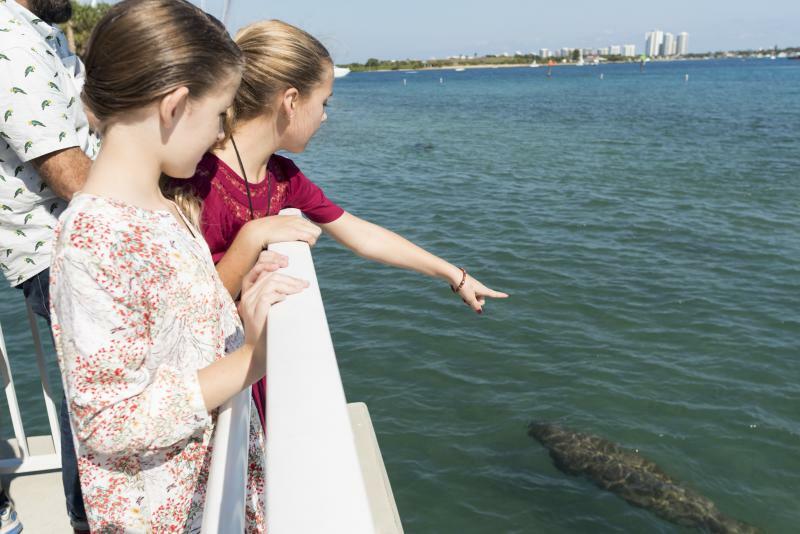 Large, slow and peaceful, the manatee is almost exclusively vegetarian and can be spotted chomping seagrass on waterways, in saltwater and freshwater, across the state. And they’ve been here for a while. Ancestors of today’s manatee came to the Sunshine State way before it was called the Sunshine State; in fact, fossil remains of manatee ancestors date back to about 45 million years ago. Modern manatees have been in Florida for over one million years. The Florida manatee population has increased over the past few decades, and the species was recently down-listed from endangered to threatened, however all of the same federal protections will remain in place for manatees, which are migrating from their wintering grounds near warm-water outpours and coastal springs. The animals remain protected under the Marine Mammal Act. Currently, the population in Florida is estimated at more than 6,000; however, impacts from human activity, cold stress, red tide and habitat threats pose challenges to this peaceful mammal. FPL supports manatee research and conducts tagging exercises and aerial surveys at its facilities to help determine the health of manatee herds. Visit the Save the Manatee Club® website to play games, send manatee postcards, watch videos and more. One of the manatee’s closest modern relatives is the elephant. Manatees typically move slowly, but can swim up to 20 miles per hour. Please note that Manatee Lagoon – An FPL Eco-Discovery CenterⓇ, exercises no control nor takes responsibility for any individual, organization, product, information or service appearing on this site — or that is electronically linked to this site. The Manatee Lagoon website does not feature a comprehensive list of information sources regarding manatees and inclusion of external links featured on this website does not constitute an endorsement of any kind.